My all time favorite cozy color combo is red and white. 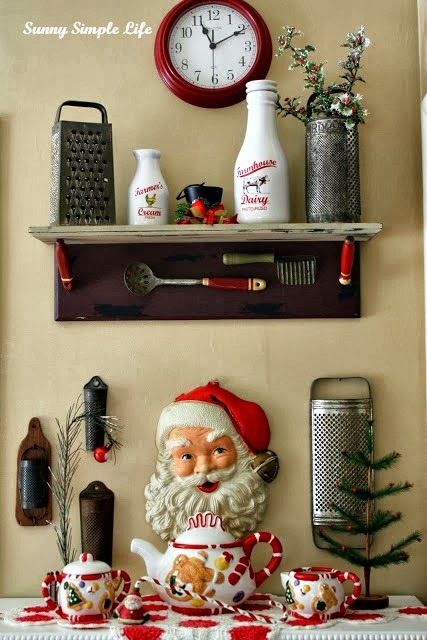 My home may have a prim rustic side but my vintage kitchen is all red and white galore. 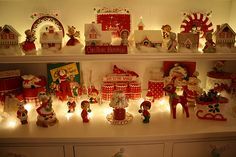 Whether it is Christmas decor. 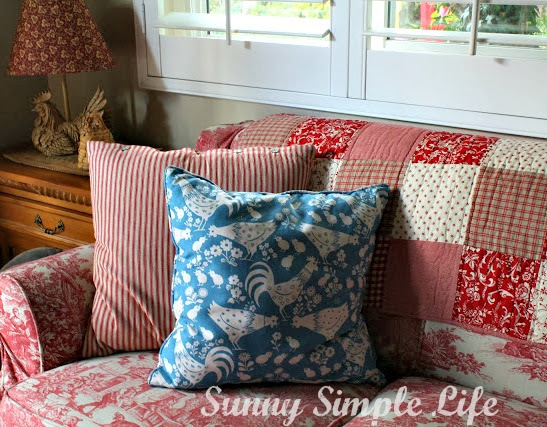 Or simple gingham gift wrappings, red and white decor just says home and comfort and cozy. Even down to a couch and quilt, it makes me happy to see it in a room. Heck, I even love red and white in a cup. 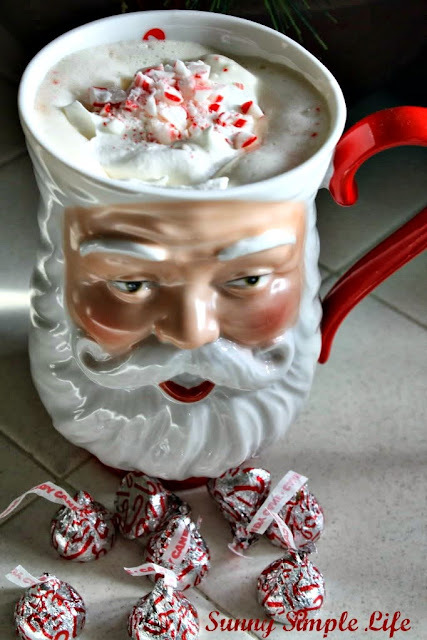 My poor man's white chocolate peppermint mocha just makes me happy. Can't wait to make them this year. But the Queen of red and white is my friend Shelly. Her house makes me smile and is such a treasure to sit in and look around. She has a way of display that is so darn cute. I have shared some tours of Shelly's place but if you want to see more of her home then you need to follow her pinterest boards. She refuses to blog, which saddens me but she pins pics of her home and if you scroll down on her pinterest boards to House of Bliss you can see her home everyday and at holidays. You will not be disappointed. You know full well how much I love it! In fact I too posted on color today. We color decor gals have to stick together. I'm going to look at her Pinterest boards. Bet there's a lot for me to pin! I love reds too! I strayed away from red in my kitchen for awhile but it's been creeping back in lately. I think it's such a cheerful color. It especially brightens up dark winter days. I checked out Shelly's link, and I think you're right, she really needs to blog about her beautiful home! I love the reds in a kitchen so much! Red and white is such a cheerful color combination. I love it too! Thanks for sharing your friends house again.... so fun. I recognized the Country General Store right away. I'm headed over to check out Shelly's pinterest board. Such cute decor. I can't imagine the work of totally redoing the decor with every holiday theme, but it is worth it. I love red too! I am heading over to check out Shelly's link ! Wonderful post! I'm more of a blue person..but I love the red too...its a happy color! Have a wonderful day!! I love red & white too :) Your couch is beautiful! I just followed ALL of Shelly's boards on Pinterest! I am a red girl too! I always love your kitchen! Who does the red and white quilt belong to? I spied it and loved it! I just love your vintage kitchen, Elaine. I'm a red lover, as well. FYI, my blog address has changed. Hope you'll still stop by and visit occasionally. I love your shelf! My mom gave me some old, green kitchen tools and they're in a drawer while I tried to decide what to do with them. Thanks for the idea! OMG the cutest kitchen ever!!!!!!!!!! I like red and white, too. I don't have a lot of that particular combo but I have a lot of red in the house. And some ivory or cream. I love red in decor, and red and white is always so charming. Pinterest isn't working for me right now...I'm trying to follow Shelley's pages and it's not letting me. Will keep trying! You know me...just coming around to the idea that I REALLY DO LIKE COLOR! What a sneaky thing to do...let us in on Shelly's secret...we're all stalking...er,uhm...following her now! Red and white is my favorite color combination! I like your kitchen and Shelly's kitchen. Both are so homey and cute! 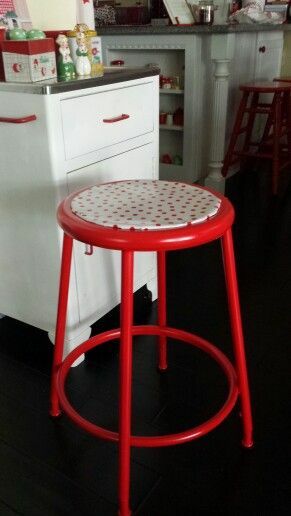 I LOVE red Kitchens and I have one myself!! Sweet photos! your friends kitchen is awesome. Santa is comin' soon!